Bank of America Corp. sees a foreboding parallel in the current direction of markets: 1998. Emerging markets are crumbling under a strong dollar while tech stocks advance amid optimism over the U.S. growth trajectory — two ingredients that might be the makings of an annus horribilis like the one seen two decades ago, according to the bank. “U.S. decoupling, flattening yield curve, collapsing EM — all echoes of 20 years ago,” strategists led by Michael Hartnett wrote in a recent note. What was deemed a localized currency crisis with the devaluation of the Thai baht in 1997 soon spread to other emerging markets, culminating in Russia’s 1998 default. That led to the demise of Long-Term Capital Management, a highly leveraged hedge fund in Greenwich, Connecticut run by John Meriwether of Liar’s Poker fame. Tightening by policy makers in the early 1990s set the stage for the dollar’s ascent of as much as 25 percent in the three years leading to 1998. Meanwhile, the yield curve inverted in June that year, Hartnett and team point out. At first blush, we’re in a similar tightening cycle today, with the gap between two- and 10-year yields hitting fresh cycle lows. Emerging markets also bear the late-90s hallmark, according to BofA. 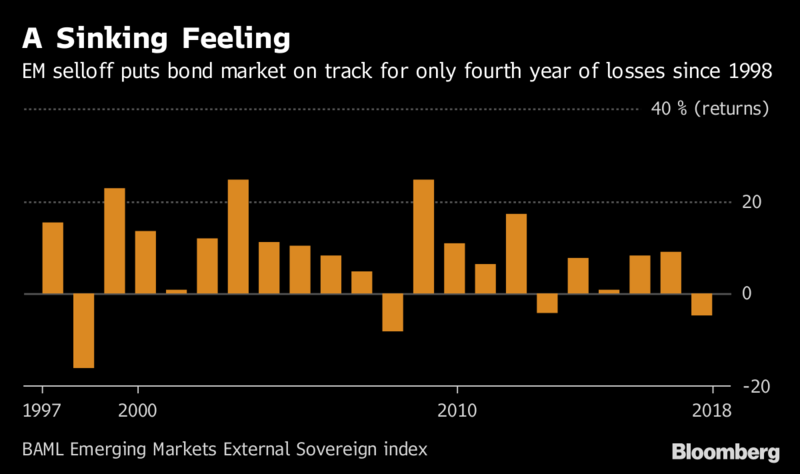 External debt markets are on track for the fourth annual decline in two decades and their worst year since the financial crisis. Still, they have a long way before they reprise 1998, which left investors nursing 16 percent losses in dollar terms on developing sovereign bonds. “2018 deleveraging pain trade equals Nasdaq to 6,000, 30-year Treasury yield to 2.5 percent, DXY to 90; oil, banks, yield curve are our favorite summer ‘tells’ for 1998 redux,” the strategists wrote. There are holes in the comparison, of course. Falling emerging-market currencies have a lot more to do with U.S. strength than developing-nation weakness, while Asia looks healthier than the crisis-addled yesteryears. Asian economies ex-Japan are projected to expand at near 6 percent through 2020. And for now, U.S. futures markets aren’t pricing-in any hint the Fed’s policy trajectory will be derailed by an aggressive tightening of financial conditions like after LTCM’s implosion in September 1998. Back then, rate cuts sent markets soaring in 1999, and fed a dot-com bubble that burst in the early 2000s. “Ultimately central banks panic and create a violent bear market rally in distressed assets” such as the tech bubble at the end of the millennium, according to Bank of America strategists.